Do you know your IDBI Bank account Customer ID? If the answer is no then here we will tell you how to find your IDBI customer ID number. What is IDBI customer ID meaning? IDBI Customer ID is containing all the important banking details of the account holder. The Customer id number is an 8 digit number and it is unique for every customer. All the customer’s accounts are linked to the one Customer identification number given to the customer. This IDBI customer ID required when you register on mobile banking and net banking also it is your IDBI net banking user id. How to Find My IDBI Customer ID? If you are IDBI Bank customer can unable to find your Customer ID then follow below two methods to know your customer ID. You can check your user id in your personalized Cheque Book. Open your IDBI cheque Book front page where your account details are printed. 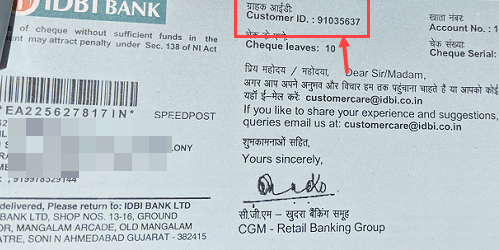 You can see your Customer ID also printed on Cheque Book front page as you can see below screenshot. IDBI customers can also find his/her account customer id in Physical passbook. Open your physical passbook where your bank account details are printed. You can see your customer ID also printed on passbook. So by following these three methods, IDBI customers can find his/her customer ID.